Disk cloning can save IT companies, computer manufacturers and system distributors hours of billable time both on the front end and back end of mass system deployment. Expanding a division or upgrading systems for an entire department can mean dozens, even hundreds of new machines that need to be loaded with the appropriate software and configured to work on your company's network. Making sure that all of your company's computers have identical base configurations is important for system-wide security updates, compatibility and speedy tech support down the road. Your technicians can painstakingly set up each and every machine one by one with the exact same settings. Or you can configure just one machine and replicate the settings and data on to the other computers. This is disk cloning in a nutshell, and that's one of the things that R-Drive Image does best. 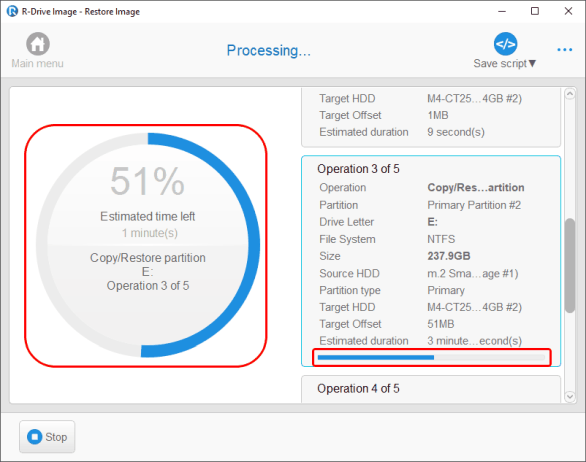 With R-Drive Image, you can quickly copy data from one hard drive (the source disk) to one or more other computers (target disks). R-Drive Image has a number of unique features that makes batch system deployment and large scale computer set up a breeze. Easy-to-use wizard interface that provides step-by-step instructions for cloning disks to meet your specific needs. Powerful scripting that can be used to automate the cloning process. No coding required; scripts can be generated via the wizard interface. Support for non-MBR (master boot record) disk layouts. 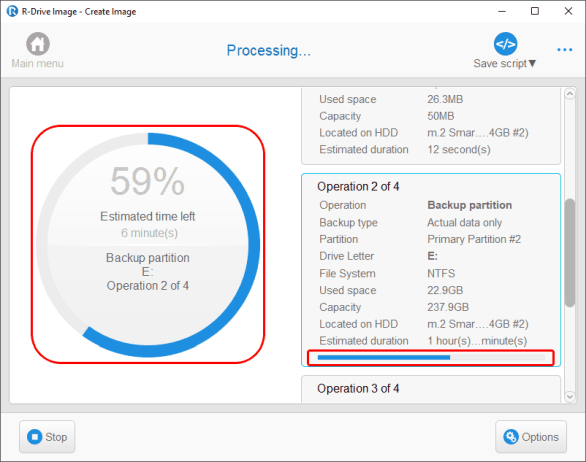 You may read more about R-Drive Image features in the article Backup Software. Backup with Confidence. R-Drive Image Commercial System Deployment License - For original equipment manufacturers (OEMs) and system integrators. R-Drive Image OEM Kit - Allows distributors and technicians to include R-Drive Image System Recovery OEM for end-user system recovery. R-Drive Image's flexible licensing options makes it one of the most cost-effective disk cloning solutions on the market. See the R-Drive Image Licensing page for more details. Disk-to-disk cloning is simple, straightforward and doesn't require any additional disk space on the source machine. Because of this, copying a disk to a disk is recommended for small computer batches. 1. Connect the source disk and the destination disks to a computer with an installed copy of R-Drive Image. Start the machine. 2. 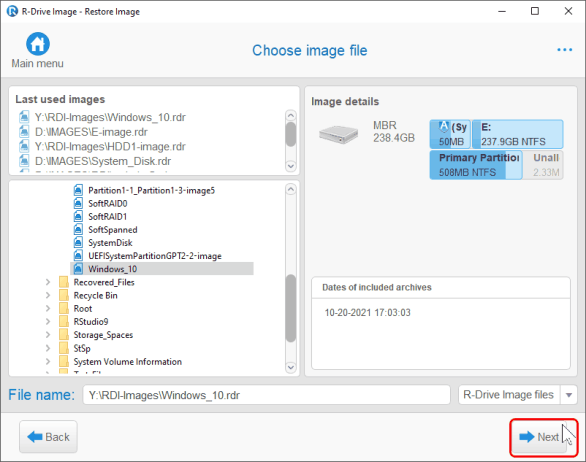 Run R-Drive Image and select Copy a Disk to a Disk on the Action Selection panel. 3. The next screen will be the Object Selection panel. First, select the source disk from the first list by clicking its icon. Note: Disregard the drive letter on the source disk. Windows will automatically assign the correct drive letter when starting the cloned disk. For example, the cloned drive will still be assigned C:\ (or whichever is the primary drive letter) on the target machine, even if the drive letter of the source disk is G:\. 4. Next, select the destination disk by clicking its icon in the second list. Click Next to continue. 5. In the Restore/Copy Parameters panel, you'll have four different options to choose from under "Copying mode." 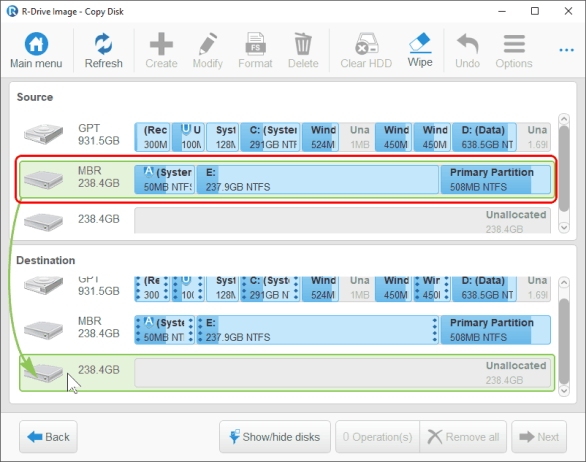 Choose "Raw disk copy" if you'd like to create an exact copy of the entire content of the source disk on the destination disk, including the empty space. This mode is slower, but it creates an exact sector-by-sector copy of the original disk, regardless of partitioning method. If previously cloned disks failed to boot due to non-standard boot loaders or other issues, try raw disk copy. 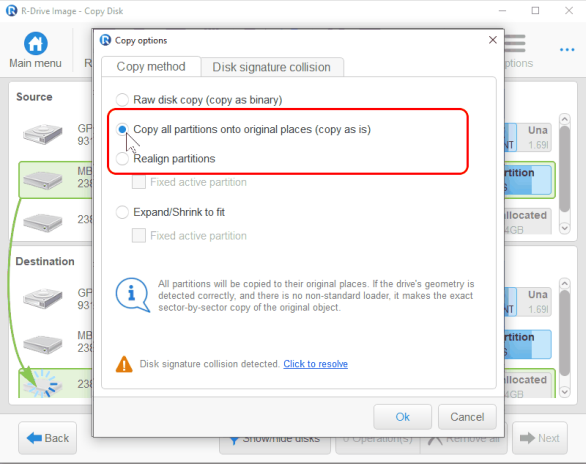 Select "Copy all partitions onto original places" if you want to copy only those parts of partitions where files and other data reside. 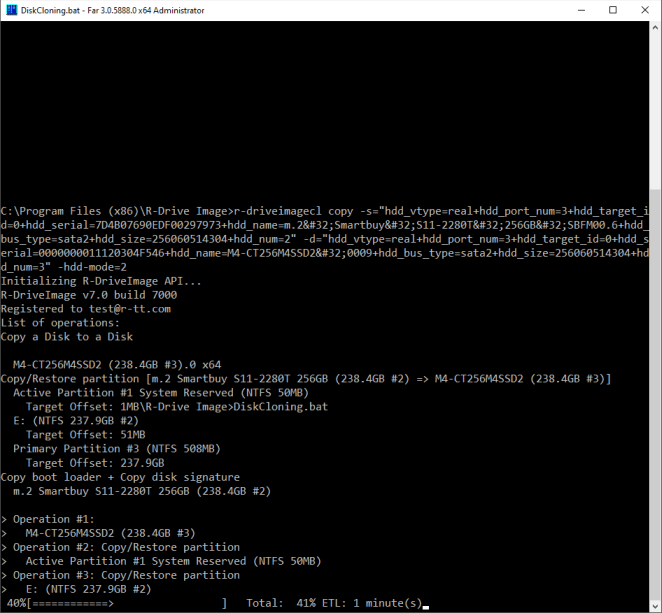 This is fast, but the empty space will be different on the target disk. 6. Verify that the copy parameters are correct on the Processing panel. If so, click Start. 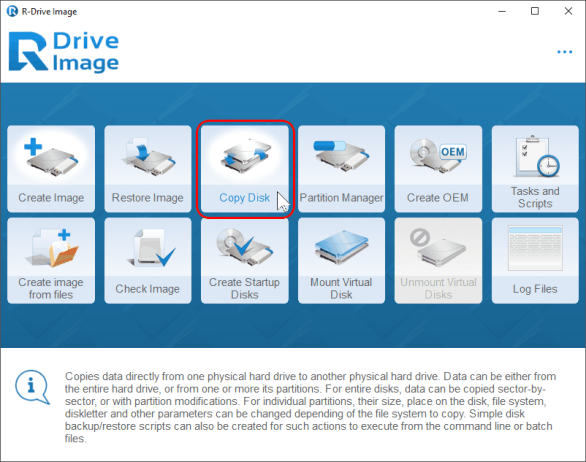 After clicking Start, R-Drive Image begins cloning the disks. You can see the progress of each process in the top bar and the progress of the entire procedure on the lower bar. 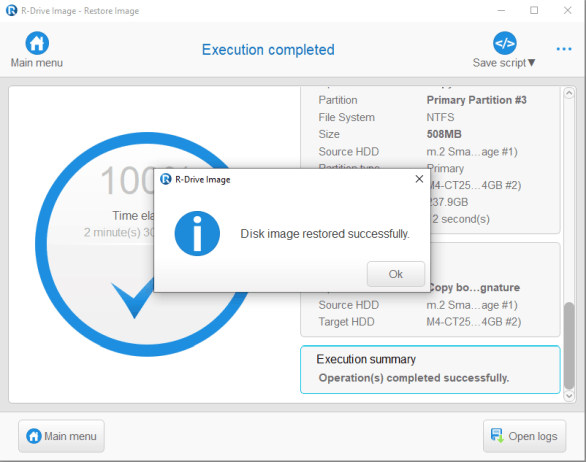 When the disk cloning is completed, R-Drive Image will notify you that the disk was copied successfully and you can now safely disconnect the drive. 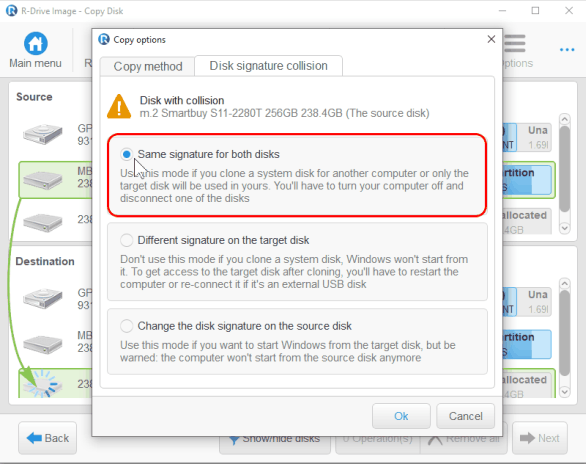 You can now disconnect the target disk and connect the next disk to continue cloning. You may need to power your computer down to disconnect the completed target disk and to connect a new one. If you'd like to repeat a disk cloning job without going through all the above steps each time, you can create a script based on the configuration that you set up in the wizard. 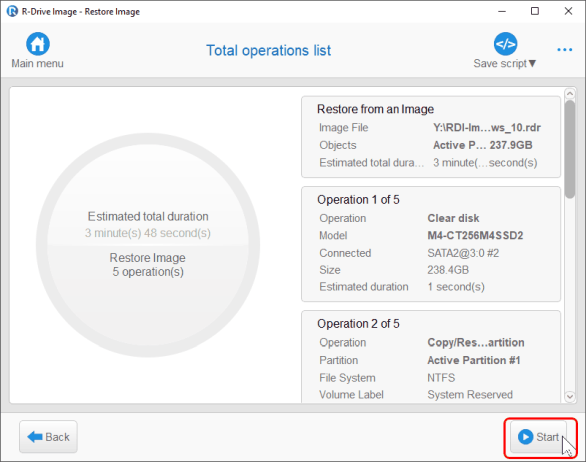 This script can be used to launch R-Drive Image and have it automatically clone a disk based on the parameters you've previously selected. You need only to change the target disk. 1. From the Processing panel in step 6, instead of clicking Start after reviewing your configuration, click Script to Clipboard. This will automatically save the script to your Windows clipboard. 4. Save the text file with the extension .bat. Do so by clicking File and choosing Save as... In the Save As dialog box, click the drop-down menu next to "Save as type" and choose "All files." Give your script a filename ending with .bat, such as "rdriveclonejob1.bat" or "copy.bat." 4. 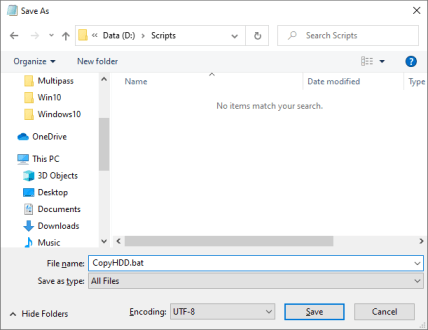 You can run the script by typing it's filename from the command line or right-clicking and choosing "Run" from Windows explorer. 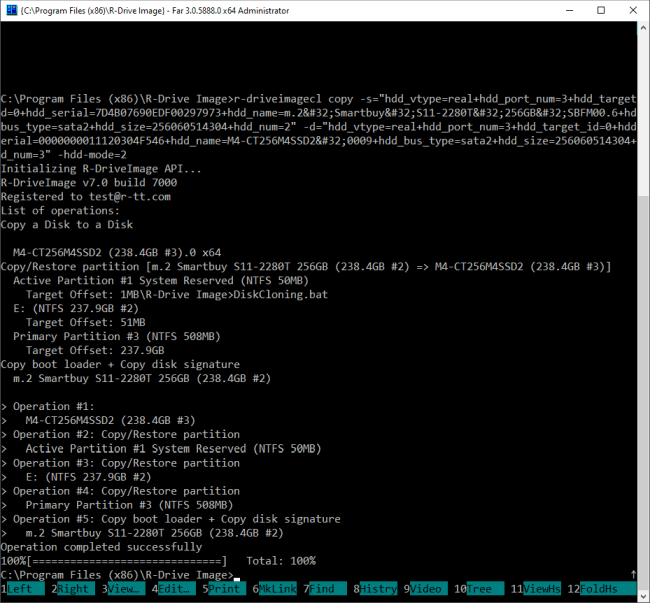 R-Drive Image starts cloning the disk, showing its progress in the Command Prompt window. When the disk cloning is completed, R-Drive Image will notify you that the operating was completed successfully. 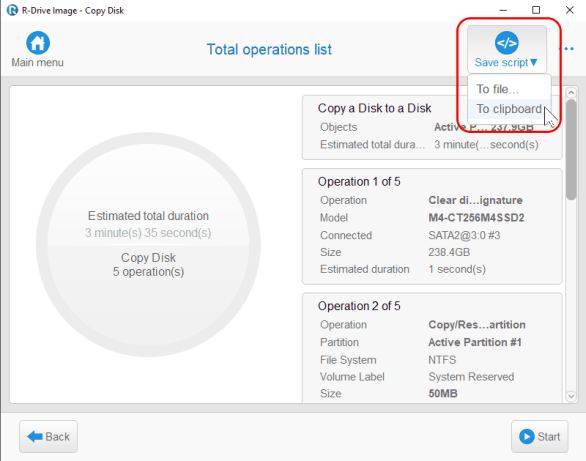 Disk cloning from a disk image is recommend for large computer batches or multiple deployments, as the disk image can be used to clone additional disks even if the source machine has already been delivered. "Creating an image from the source disk. Copying the data from the image to the target disk(s). Because a disk image is an exact replica of the data from the source disk, it may require a large amount of free disk space for storage. 1. From the Action Selection panel, choose Create an Image. 2. 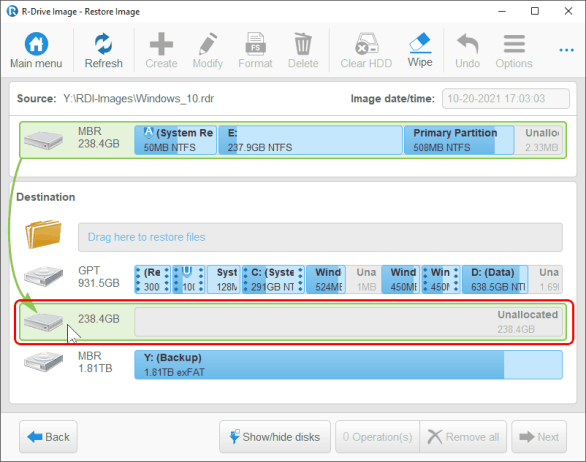 From the Partition Selection panel, select the source disk by clicking its icon. Click the Next button. Note: Again, disregard the drive letter of the source disk-Windows will assign an appropriate drive letter when mapping the cloned disk. 3. In the next window, you'll be asked to choose a destination and file name for your disk image. Choose a folder on a drive that has enough free space to accommodate the contents of the source disk and click Next. Tip: Images can be stored on the local disks of the computer used to for the disk cloning, or on a network server. Storing images on a network server makes them accessible for all computers on the network, but data transfer is slower. 4. Specify the image options on the Image Options panel and click Next. See below for an explanation of image options. Under "Backup type," choose "backup actual data only" to only copy useful data onto the image. This greatly reduces the file size of the disk image. You can also choose "sector by sector backup" to create an exact copy of the source disk, though the file size will be larger, since empty space is included. Under "image compression ratio," slide the bar to the left for faster processing speed and slide to the right for smaller size. Check the box just above this section to verify the disk image immediately after creation. The remaining parameters can be safely left alone. Advanced users can refer to the R-Drive Image on-line help for more information on them. 5. 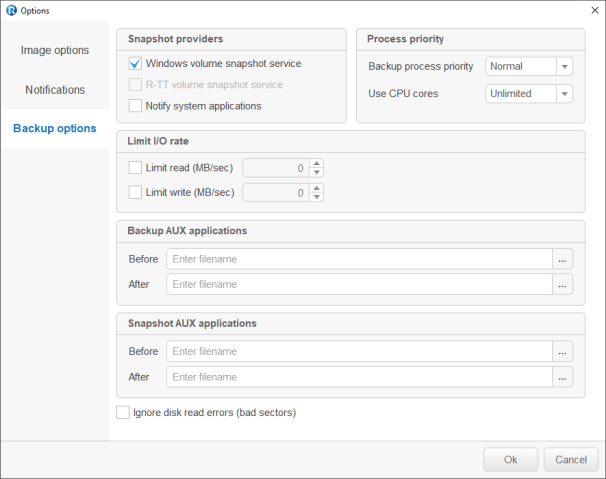 The options on the Backup Options panel can also be left with their default settings. Simply leave them as they are and click next. Advanced users can refer to the R-Drive Image on-line help for more information on these settings. 6. 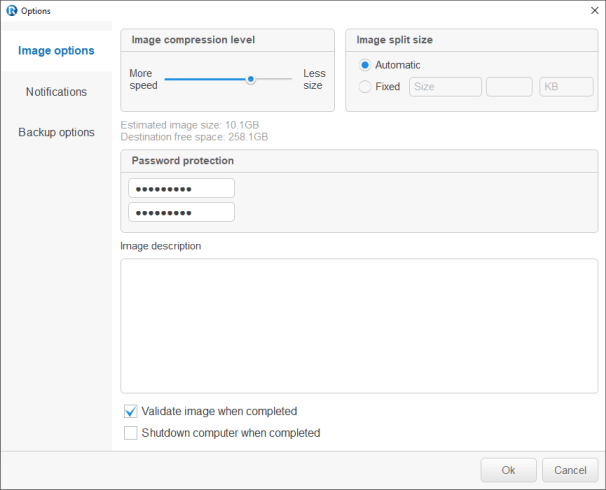 Verify that the image creation parameters are correct on the Processing panel and click Start. R-Drive Image starts creating the image. When the image file is created, R-Drive Image notifies you that the image was created successfully. Your disk image is now completed and ready to clone. If you wish, you can disconnect the source drive (as long as you have the disk image saved on another local or network drive). 2. In the next window, select the image file that you created in the above steps. Click Next to continue. 3. 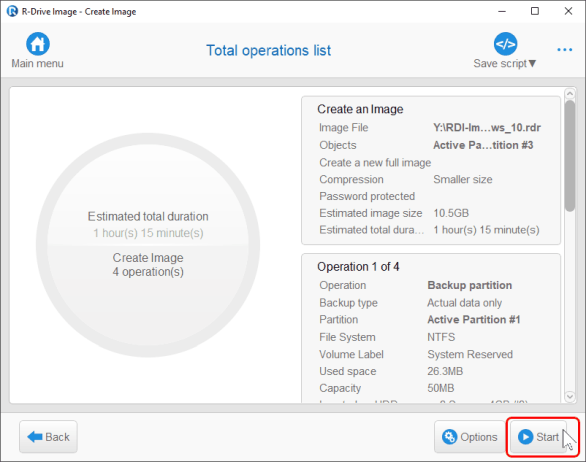 From the Image Object Selection panel, choose the source disk from within the image file. 4. 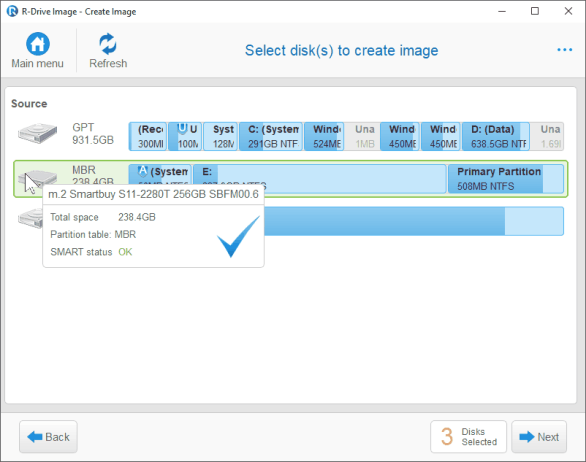 Select the target disk by clicking its disk icon on the Image Object Selection panel and click Next. 5. 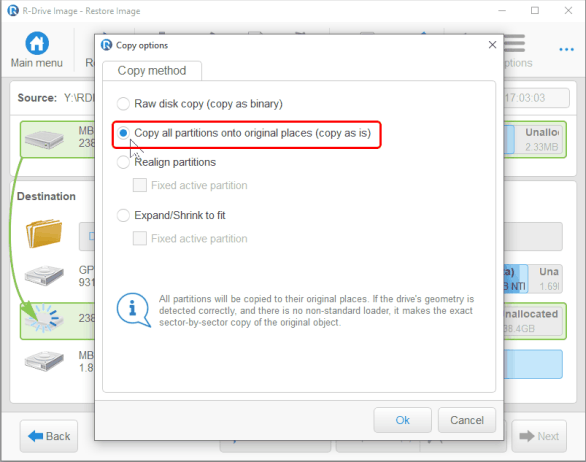 Select "Copy all partition onto original places" on the Restore/Copy Parameters panel and click Next. 6. Verify that the image creation parameters are correct on the Processing panel and click Next. Recall that you can also create a script from this window. 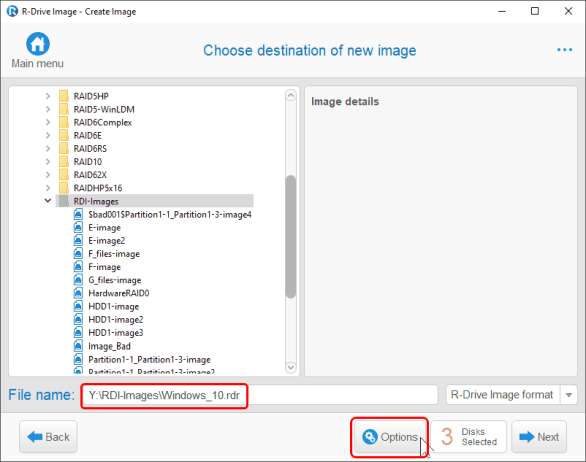 R-Drive Image starts copying data from the image onto the target disk. 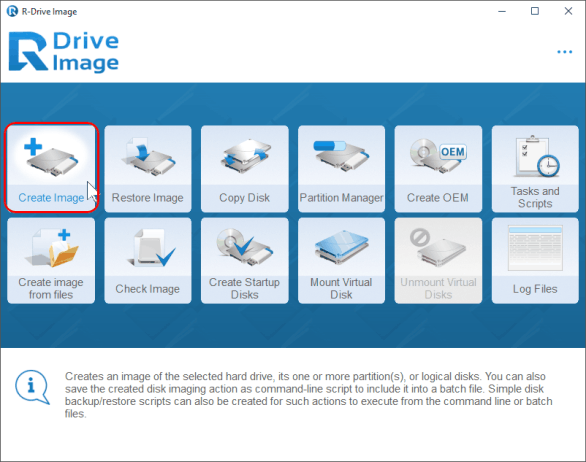 When the disk cloning is completed, R-Drive Image will notify you that the image was restored or created successfully. 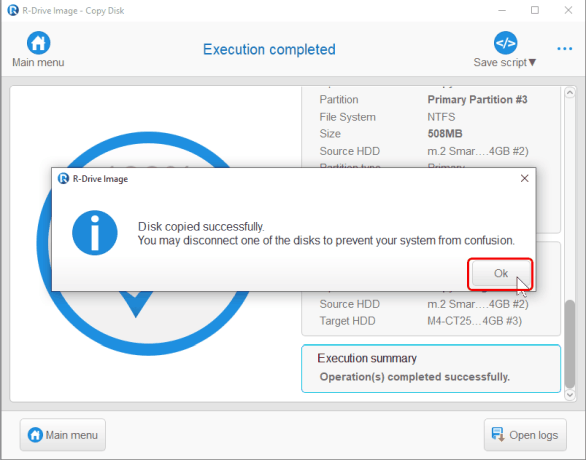 Once the disk image has been copied successfully, you can disconnect your target disk and connect the next one. You may need to eject the disk and/or power down your machine before disconnecting your drive. R-Drive Image allows you to take the arduous task of setting up a computer, installing applications, configuring drivers and establishing user credentials and accomplish it with just a few mouse clicks. This not only saves your company time and money, it also ensures that all of your computers have all of the required settings, updates and base configurations, which makes it easier to integrate them into new systems and troubleshoot hardware and software issues. In itself, R-Drive Image's core functionality vastly simplifies mass deployment of new computer systems or software upgrades for existing machines. 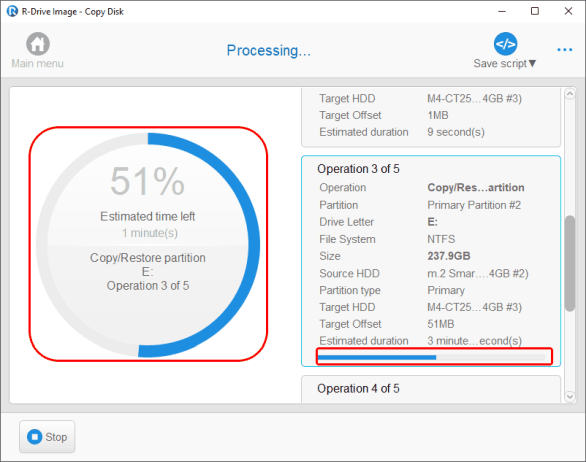 But R-Drive's powerful advanced scripting feature makes repeating this task even easier, reducing the entire process of cloning a disk into a one-click operation. 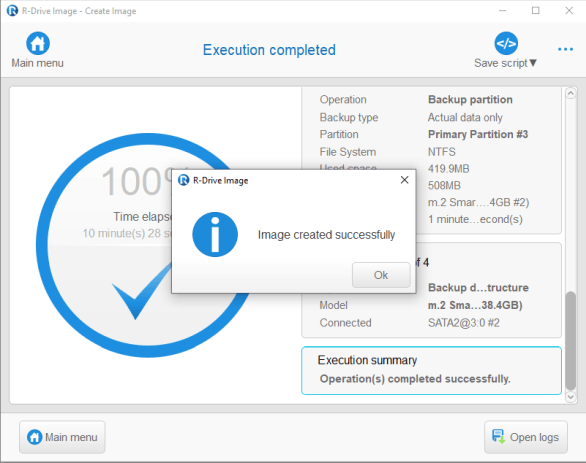 With the ability to clone a source disk onto another target disk or restore a disk from an image, R-Drive Image allows you speed and flexibility for remote and on-site system maintenance and deployment. Try it now by downloading a 15-day trial version for free. If you find R-Drive Image valuable, you can purchase a license that suits your operation's needs and budget.